Your local Dollar store carries a variety of plain and holiday printed hand-towels that provide an ideal and decorative way to use up your scrap ribbons, buttons, and fabrics. Not only do these towels spice up your kitchen, they also make great hostess gifts! 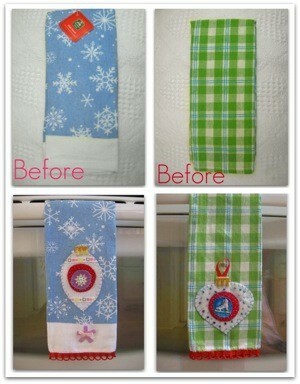 The pictured towels were purchased at Dollar Tree for $1 and embellished with scrap ribbon, felt, and buttons. Fabri-Tac was used to attach the ornament shaped embellishment and the hem trim was hand-stitched onto towel. This is a great idea! Wish I had thought of it. Excellent gift to have on hand. Perfect for a teacher, neighbor, or friend. Thanks for sharing! Is the trim on the towels crocheted? What stitch did you do?